During normal voiding, a coordinated series of events occurs: concurrent relaxation of the pelvic floor muscles and external sphincter and relaxation of the bladder neck, followed immediately by sustained detrusor contraction. 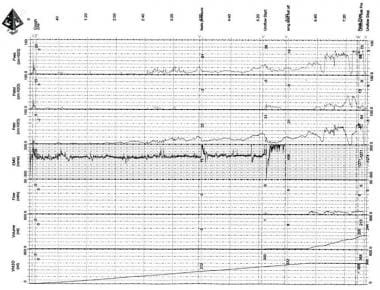 The resultant uroflowmetry pattern recorded shows a bell-shaped flow curve with a rapid rise to peak amplitude. Following voiding, the bladder pressure decreases rapidly, the pelvic floor muscles contract, and the bladder neck closes. Phasic increases in detrusor pressure (detrusor overactivity) may be associated with frequency, urgency, and urgency urinary incontinence in patients with idiopathic overactive bladder and neurogenic detrusor overactivity (see image below). In patients with end-stage renal disease, bladder compliance decreases the longer the duration of dialysis continues. Moreover, the presence of anuria contributes to further decreases in bladder capacity and compliance. In patients with suspected bladder outlet obstruction, a pressure/flow study is used to confirm the diagnosis. In this study, the detrusor pressure required to void is plotted against the resultant flow rate. A finding of a high voiding detrusor pressure with a low flow rate indicates bladder outlet obstruction. Lastly, in patients with neurogenic bladder dysfunction, the detrusor leak point pressure is used to assess the risk for upper urinary tract damage. [5, 6] A detrusor leak point pressure of more than 40 cm H2 O is associated with an increased risk of upper urinary tract damage. Detrusor leak point pressure (DLPP): The lowest detrusor pressure at which urine leakage occurs in the absence of either a detrusor contraction or increase in abdominal pressure. In patients with neurogenic lower urinary tract dysfunction (ie, spina bifida, spinal cord injury), bladder pressure monitoring as part of a urodynamic study is important to ensure that bladder pressures during filling remain within the safe range (< 40 cm H2 O) to decrease the risk of upper urinary tract damage. In male patients with lower urinary tract symptoms, bladder pressure measurements and flow rates during voiding (pressure/flow study) are used to determine the presence of bladder outlet obstruction. In patients with refractory lower urinary tract symptoms, bladder pressure monitoring can determine if involuntary bladder contractions (detrusor overactivity) is occurring during bladder filling. In women with lower urinary tract symptoms after incontinence surgery, bladder pressure monitoring during voiding can help identify postoperative bladder outlet obstruction. The AbViser is contraindicated in patients with a history of bladder rupture or bladder wall repair within the prior 3 months. In addition, the AbViser must be replaced at the time of urinary catheter and/or tubing change. Of note, there does not appear to be an increased risk of nosocomial urinary tract infection with systems using a closed transducer. Urodynamics should not be performed if the patient has or is actively being treated for a urinary tract infection. In patients on clean intermittent catheterization, bacteria are often present in the urine (colonized) in the absence of an acute infection. A urine dipstick test is helpful; the presence of significant pyuria would suggest a urinary tract infection, and the procedure should be canceled and urine cultured. In addition, a significant amount of stool in the rectal vault interferes with the abdominal pressure monitoring and therefore requires management prior to proceeding with the study. Lastly, if the patient has cardiovascular issues and/or orthopedic hardware in place, the patient or the physician providing the cardiovascular and/or orthopedic care should be consulted regarding the need for prophylactic antibiotics. Undergoing a urodynamic study can provoke anxiety in a patient. Issues such as modesty and concern regarding discomfort during and after the procedure may be worrisome to the patient. It is ideal for the room where the procedure will be performed to be quiet and separate from busy patient flow areas. Avoid loud music and interruptions by other staff during the procedure. Also, all reasonable attempts to maintain patient modesty should be undertaken. Lastly, it is important to engage the patient during the procedure, as it is imperative to document what the patient is sensing during the procedure (ie, urgency at the time of an involuntary detrusor contraction, sensation when he/she would first think of using the restroom, when he/she feels a strong urge to void that would prompt voiding). In patients who void volitionally and are not on clean intermittent catheterization, urinalysis is recommended prior to urodynamic evaluation, as well as urine culture and treatment if urinalysis findings are positive. In patients with an indwelling catheter and/or who are on clean intermittent catheterization, a urinalysis is obtained. If significant pyuria is present and/or the patient has symptoms of a urinary tract infection, a urine culture should be obtained. The literature neither supports nor refutes the use of prophylactic antibiotics during IABP monitoring. Bombieri et al performed a prospective study evaluating the incidence and natural history of urinary tract infections in 214 women undergoing urodynamic evaluation and noted a bacteriuria incidence of 7.9% after urodynamics. Of the 17 women with bacteriuria, it was found to be transient in 4, persistent in 9, and late-developing in 4. Only one of the 17 women had symptoms. Advanced age was the only variable associated with bacteriuria after urodynamic evaluation. Thirty-four percent (34%) of the women undergoing urodynamic evaluation had irritative symptoms after the study. Peschers et al performed a single blind prospective randomized study comparing a single postprocedure dose of cotrimoxazole to placebo after urodynamics. Seventy women were prescreened to rule out a urinary tract infection and then underwent multichannel urodynamics with a single dose of cotrimoxazole or placebo after the procedure. Two women in the treatment group (2 of 37, 5.9%) and 2 in the placebo group (2 of 33, 6.1%) developed a urinary tract infection after the urodynamics. Unfortunately, the power of the sample size was too small to draw conclusions as to the efficacy of prophylaxis. Levin RM, Horan P, Liu SP. Metabolic aspects of urinary bladder filling. Scand J Urol Nephrol Suppl. 1999. 201:59-66; discussion 76-99. [Medline]. Ritchey M, Ferrer F, Shearer P, Spunt SL. Late effects on the urinary bladder in patients treated for cancer in childhood: a report from the Children's Oncology Group. Pediatr Blood Cancer. 2009 Apr. 52(4):439-46. [Medline]. Chen JL, Lee MC, Kuo HC. Reduction of cystometric bladder capacity and bladder compliance with time in patients with end-stage renal disease. J Formos Med Assoc. 2012 Apr. 111(4):209-13. [Medline]. Porru D, Jallous H, Cavalli V, Sallusto F, Rovereto B. Prognostic value of a combination of IPSS, flow rate and residual urine volume compared to pressure-flow studies in the preoperative evaluation of symptomatic BPH. Eur Urol. 2002 Mar. 41(3):246-9. [Medline]. McGuire EJ. Neurourologic findings with applicability to incontinence and urethral function. Advanced Studies in Medicine. 2002. 2(19):681-9. Snodgrass WT, Gargollo PC. Urologic care of the neurogenic bladder in children. Urol Clin North Am. 2010 May. 37(2):207-14. [Medline]. Sugerman HJ. Effects of increased intra-abdominal pressure in severe obesity. Surg Clin North Am. 2001 Oct. 81(5):1063-75, vi. [Medline]. Cheatham ML, Sagraves SG, Johnson JL, White MW. Intravesicular pressure monitoring does not cause urinary tract infection. Intensive Care Med. 2006 Oct. 32(10):1640-3. [Medline]. Malbrain ML. Different techniques to measure intra-abdominal pressure (IAP): time for a critical re-appraisal. Intensive Care Med. 2004 Mar. 30(3):357-71. [Medline]. AbViser: Intra-abdominal Pressure Monitoring System. ConvaTec Inc., 2012. (Accessed June 2, 2012, at http://abviser.com/.). Putran J SB. Incidence of urinary tract infection after urodynamic study: Are prophylactic antibiotics necessary. The Internet Journal of Gynecology and Obstetrics. Bombieri L, Dance DA, Rienhardt GW, Waterfield A, Freeman RM. Urinary tract infection after urodynamic studies in women: incidence and natural history. BJU Int. 1999 Mar. 83(4):392-5. [Medline]. Peschers UM, Kempf V, Jundt K, Autenrieth I, Dimpfl T. Antibiotic treatment to prevent urinary tract infections after urodynamic evaluation. Int Urogynecol J Pelvic Floor Dysfunct. 2001. 12(4):254-7. [Medline]. Cheatham ML, Malbrain ML, Kirkpatrick A, Sugrue M, Parr M, De Waele J. Results from the International Conference of Experts on Intra-abdominal Hypertension and Abdominal Compartment Syndrome. II. Recommendations. Intensive Care Med. 2007 Jun. 33(6):951-62. [Medline]. Sugrue M, Bauman A, Jones F, Bishop G, Flabouris A, Parr M. Clinical examination is an inaccurate predictor of intraabdominal pressure. World J Surg. 2002 Dec. 26(12):1428-31. [Medline]. Intraabdominal pressure monitoring techniques. (Accessed April 26, 2012, at http://www.abdominal-compartment-syndrome.org/monitoring techniques/monitoring.). Fritsch DE, Steinmann RA. Managing trauma patients with abdominal compartment syndrome. Crit Care Nurse. 2000 Dec. 20(6):48-58. [Medline]. Kron IL, DiMarco JP, Harman PK, Crosby IK, Mentzer RM Jr, Nolan SP. 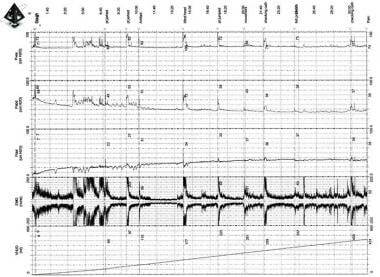 Unanticipated postoperative ventricular tachyarrhythmias. Ann Thorac Surg. 1984 Oct. 38(4):317-22. [Medline]. GO Davoric JZ. Fluid-Filled Monitoring Systems. Davoric G, ed. Hemodynamic Monitoring: Invasive and Noninvasive Clinical Application. 3 ed. Philadelphia, PA: W. B. Saunders Co; 2002. 113-31. De Keulenaer BL, De Waele JJ, Powell B, Malbrain ML. What is normal intra-abdominal pressure and how is it affected by positioning, body mass and positive end-expiratory pressure?. Intensive Care Med. 2009. 35:969-76. Cheatham ML, De Waele JJ, De Laet I, De Keulenaer B, Widder S, Kirkpatrick AW. The impact of body position on intra-abdominal pressure measurement: a multicenter analysis. Crit Care Med. 2009 Jul. 37(7):2187-90. [Medline]. Kimball EJ, Mone MC, Wolfe TR, Baraghoshi GK, Alder SC. Reproducibility of bladder pressure measurements in critically ill patients. Intensive Care Med. 2007 Jul. 33(7):1195-8. [Medline]. Shuster MH, Haines T, Sekula LK, Kern J, Vazquez JA. Reliability of intrabladder pressure measurement in intensive care. American journal of critical care : an official publication, American Association of Critical-Care Nurses. 2010. 19:e29-39; quiz e40. Intra-abdominal pressure monitoring device C. R. Bard, Inc, 2012. (Accessed June 2, 2012, at http://www.bardmedical.com/Intra-abdominalPressureMonitoringDevice.). Holtech medical: The IAP monitoring company. Holtech Medical. (Accessed 6//2/2012, 2012, at http://www.holtech-medical.com/instructions_for_use.shtml.). Kirkpatrick AW, Brenneman FD, McLean RF, Rapanos T, Boulanger BR. Is clinical examination an accurate indicator of raised intra-abdominal pressure in critically injured patients?. Can J Surg. 2000 Jun. 43(3):207-11. [Medline]. Obeid F, Saba A, Fath J, Guslits B, Chung R, Sorensen V. Increases in intra-abdominal pressure affect pulmonary compliance. Arch Surg. 1995 May. 130(5):544-7; discussion 547-8. [Medline]. Cheatham ML, Safcsak K. Intraabdominal pressure: a revised method for measurement. J Am Coll Surg. 1998 May. 186(5):594-5. [Medline]. Malbrain ML, Cheatham ML, Kirkpatrick A, Sugrue M, Parr M, De Waele J. Results from the International Conference of Experts on Intra-abdominal Hypertension and Abdominal Compartment Syndrome. I. Definitions. Intensive Care Med. 2006 Nov. 32(11):1722-32. [Medline]. Abrams P, Cardozo L, Fall M, Griffiths D, Rosier P, Ulmsten U. The standardisation of terminology of lower urinary tract function: report from the Standardisation Sub-committee of the International Continence Society. Neurourol Urodyn. 2002. 21(2):167-78. [Medline]. Cundiff GW, McLennan MT, Bent AE. Randomized trial of antibiotic prophylaxis for combined urodynamics and cystourethroscopy. Obstet Gynecol. 1999 May. 93(5 Pt 1):749-52. [Medline]. UnoMeter™ Abdo-Pressure™ IAP monitoring system. Proper positioning of the Foley manometer in the UnoMeter Abdo-Pressure Kit. AbViser intra-abdominal bladder pressure-monitoring device.